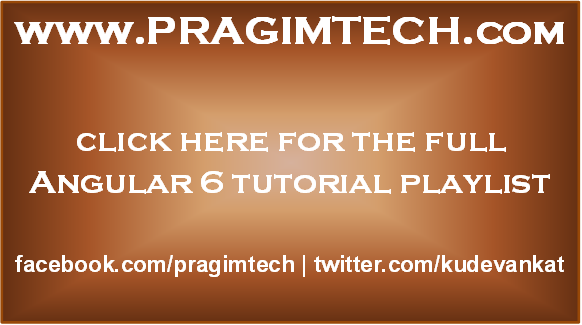 In this video we will discuss nested form groups in a reactive form. Along the way, we will also discuss working with radio buttons in a reactive form. Let's understand, creating nested form groups with an example. 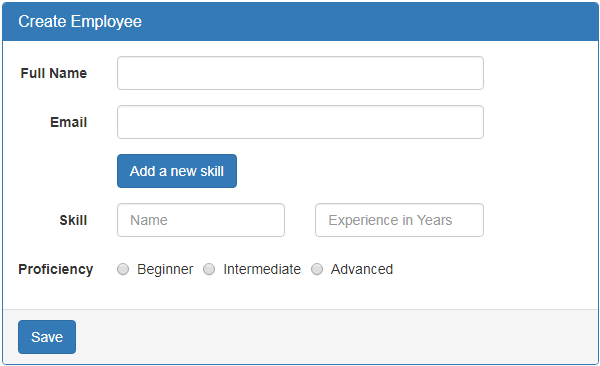 In addition to fullName and email, we want to add the following 3 fields to "Create Employee" form. What we want to be able to ultimately do is add multiple skills dynamically at run time, by clicking "Add a new skill" button. Also, another additional requirement is to keep "Add a new skill" button disabled, until all the skill related fields are properly filled and valid. 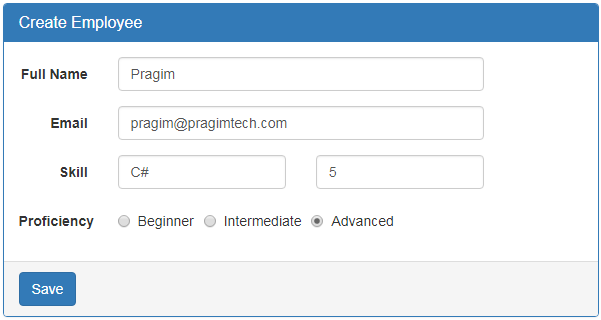 So in short, the requirement is to dynamically create a group of form fields and also validate them as a single group so "Add a new skill" button can be enabled or disabled based on the validation state of the group. This can be very easily achieved using a nested form group. 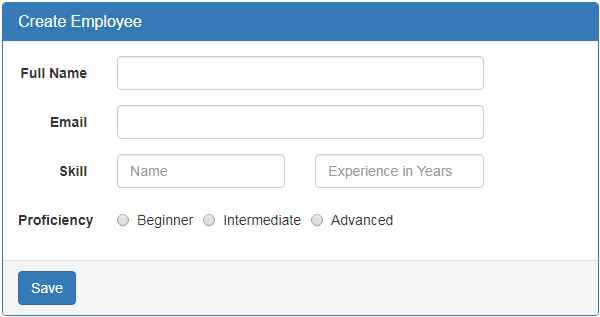 So, first let's create a nested form group for skill related fields in the component class. Step 1: Creating a nested form group in the component class : Form groups can accept both form control and form group instances as children. This allows us to create a nested form group. Modify the code in ngOnInit() life cycle hook as shown below. Notice we have created a nested form group with key - skills. This nested form group contains 3 form controls. Step 2: Grouping the nested form in the template : To group the form elements in the HTML, encapsulate the form elements in a <div> element and use the formGroupName directive on that container <div> element. Bind the formGroupName directive to the skills FormGroup instance in the component class. Bind each input element in the HTML, to the corresponding FormControl instance using the formControlName directive. <input type="text" placeholder="Experience in Years"
At this point, save all the changes and when you fill out the form. skills nested formgroup value is reflected on the page. Please note : If you do not see the nested formgroup value displayed, make sure you have the following in the template after the closing <form> element. In our upcoming sessions we will discuss, form validation and dynamically adding form controls.